After having my baby, race goals were definitely NOT a priority. Being home for Timmy was my priority. I have still kept up with running in that time but definitely not as extreme as before. Last year I completed one half marathon. I didn't care about my time goal (although we did have a goal in mind as I was running with some friends). 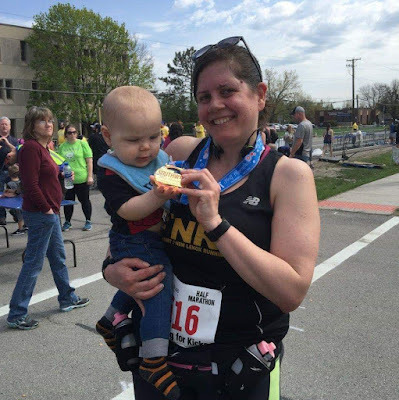 Completing my first half marathon post-baby was my goal. It wasn't easy and even being away for my long runs was difficult. I like having "me" time but I still felt guilty. But I finished the half marathon and even got the goal we wanted. So it was a win-win. Not too much happened by way of running last year. I tried to get better/faster. But was plagued by a random (not serious) foot issue. I also slept past the triathlon I had signed up for. Let's just keep it at ... uneventful. This year, I decided to sign up for another half marathon, because it requires effort and training. So when I finish, I feel like I actually accomplished something (no matter how slow I am). On Saturday, April 6th, I'm running the Milwaukee Half Marathon. I'm excited about it. I do have a time goal in mind but I'm happy no matter what (I say that but do I really mean that??). So I signed up for the Wisconsin 70.3 in Madison on June 9, 2019. At first, I wasn't going to tell anyone (but my husband, of course). But in true fashion, I blurted it out on my facebook. I'm so weak. So I have been swimming, biking, and running for the past 2 months more than I have in a long time (well, my running is the same as just training for the half). But getting up at 4:40 a.m. to swim at 5:00 a.m. on a Monday morning is definitely out of my character. I've spent endless hours on the bike trainer since I live in Chicago and spring never wants to come. So, even though I might not be training as much as some, or I know that there are things I could improve on, I'm training as much as I can right now given the fact that I still want to be home for my baby. So lots of bike trainer hours are after Timmy goes to bed at night. It's pretty exhausting sometimes. But I know it's temporary and I want to put the work in so that no matter what happens on race day, I know it wasn't from lack of trying. Good luck tomorrow at the half marathon! My name is Amanda. I'm 35 years old. I originally lost a total of 90 pounds on Weight Watchers starting in May 2007. I made my goal weight (for Weight Watchers in June 2010. I've since put back on a few pounds and am working to take that back off. I originally started this blog trying to get to my goal weight (hence the name "Get to Goal"). After I reached that goal weight, I wasn't sure what to do with the blog. Then I realized that I never stop setting goals and trying to acheive them. Therefore, I decided to keep the name of the blog. What origially started at a weight loss/healthy living blog has turned more into a running blog. I started running 5k's in 2003 but since about 2009, became more serious about running. I ran my first marathon in Chicago in October, 2011. I have now run a total of 5 marathons and I ultra 50k. I would love to hear from you. Please leave a comment on my blog or email me with any suggestions or comments!